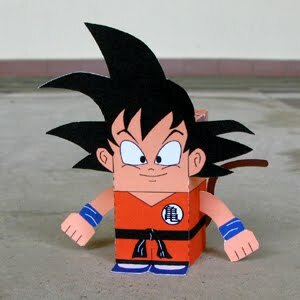 This paper toy is the Son Goku in cube style, based on the anime / manga series Dragon Ball. The papercraft is designed by Toy a Day. Goku (Son Goku), born Kakarot, is the main protagonist of the Dragon Ball metaseries created by Akira Toriyama. He is the adoptive grandson of Grandpa Gohan, the husband of Chi-Chi, the father of Gohan and Goten, the grandfather of Pan, and later great-great grandfather of Goku Jr. Goku is a defender of Earth and informally leads the Z Fighters. Throughout his life, he trains hard and strives to be the greatest warrior possible, while at the same time using his amazing strength and skills to uphold peace. These qualities make him the perfect example of a hero, though not necessarily the perfect role model, due to his lack of education.